Clara the cat was at the Columbia Humane Society for over two years when the crazy old bat found her and brought her home. She was huge and didn't move around much so she didn't appeal to most people looking to adopt. She has been with the big red guy and crazy old bat for almost 10 years. Dawson had been brought back to the Humane Society when the crazy old bat found him. He does have issues. He licked his paws all the time along with a few other odd behaviors. It just about drove the big red guy over the edge. He has been here with us for a couple of years now. We know from personal experience that age, size, breed or special needs does not mean that pets can not be a valued member of a family. Check out some of these pets and see if you can find a place in your heart for them. Remember you can always sponsor one of these pets so that they could bring joy to a special family. Mom still remembers how grammie told her that she had put clara on layaway. Hahaha it is a very worthy day. That is a great reminder, Moco! We would love to rescue us some C.A.T.s.... for dinner! So true! My madre y padre adopted me when I was about 8...and that was 7 years ago! Thank's for the reminder and I hope a whole bunch of people about an older pet next Wednesday!! LET'S HEAR IT FUR OLDER ONES!!! Mum found Cooper on Petfinder.com which I thought was a huge mistake (still do). Still, he did increase our toy alottment so I guess he is okay. Thanks for the alert on the date! Love your space stuffie too! We sure hope a lot of those animals find some nice homes. Oh that is wonderful. We are sure glad the old bat decided to bring him home.. Thanks for the very important post! Good info to know! Mom's sister does Pet Rescues, and we have fostered some of them for awhile until they can go somewhere that is safe and they can find a forever home. We are behind this 100%. I am even willing to trade Tanner for a more mellow, older, less Tanner-like dog. My mom would adopt every dawg and cat if she could. 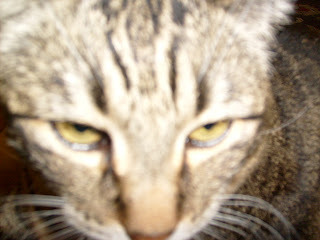 Besides me, Ziggy, Libby & Tommy, she takes care of 5 stray cats that come to our house to eat. Three she got fixed and she's trying to catch the other two now. Wish her luck because these two are tricky cats! Old pets deserve a good life too! I wish the best for them! Great message. Wilbur came from the Fort Worth animal shelter. He's a demon, but I'm sure not all of them are like that. I hope those animals find great forever homes. Older deserves the same opportunity! Have a great weekend Moco! Thank you for the reminder, Moco. I think I need a brother or sister. That's a good reminder, Moco. May these furry friends of ours find a loving home. Thanks for this important reminder, Moco. Since our Beauty died,we've been thinking of rescuing another pusscat for me to chase up and down the stairs. Rugrat still lives in the cupboard so she's no fun. I sure hope we find a kitty for me to play with. And I hope lots of dogs and cats find their furever homes. Wowzers! Your Ciera looks just like our birthday boy Taz. Stop by our blog today to see his pic. We don't let him use our blog very often because he is a big of a psychotic control freak (like most cats are) but we made an exception today. Nice meeting you! What a wonderful wonderful post!!!! I always say that if my ma ape could find a dog to put up with her then there's someone for everonye! HAHAHAHA.